I will be the first to admit that I never invited Scream into the horror fray from day one. Unlike other fans of the time, it wasn't because it was "trendy" - common sense tells us that this was the case in virtually all slasher scenarios - but because I found the film to be a thriller as a kid. I never felt the need to discredit the integrity of the production since Scream was and always will be in a class of its own. Brimming with in-jokes and bloody as hell, denying the Scream series of being influential would be foolish. It takes talent to spoof the genre in such a subtle, real way that it in itself could spawn legitimate parodies like Scary Movie and Shriek if You Know What I Did Last Friday the 13th. 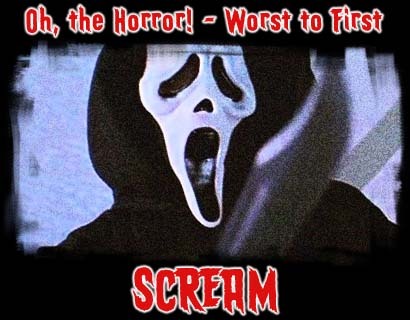 Unlike the popular 80s icons, the franchise was stuck on merely the third installment for years, but with a new fourth film on the horizon, there is no time like the present to Scream like we need it and take a look at the series and all its great kills, scenes and characters from worst to first... literally! Regrettably, Scream 3 was a low point in the series and the lone wolf I was able to catch in theaters. After two similar, tangible films, the third starts becoming nearly as goofy as the parodies it spawned, exposing Sid's mom to having been a b-movie actress in low budget shockers that are titled in such outrageous ways that Ed Wood's eyes would light up. The lack of a strong twist and new, definable characters hold it back from creating something fresh enough to grab hold of the psyche of an audience. I really felt at this point, as wonderful as Dewy, Sid and Gale are, one of them should have either died or went mad and set off on their own killing spree. The killers just didn't have it. While still worth a watch or two, you'll Scream a few times this go around for the wrong reasons. Not a re-invention (nor should it be expected to be), Scream 2 expands on the principles of the original film by laying out the stereotypical guidelines for the horror sequel (itself) to follow and earns its stripes in this regard. Bringing back all well established survivors from the first and killing off the every horror fan, Randy, bestows the film with storyline and film-to-film authenticity that few previous franchises ever had. The ending began stretching the plot and characters in ways that would have the gialli of Argento on the brink of turning red, yet Wes Craven manages to craft another fine film full of suspense, violence and wit. The ultimate bloody valentine to slasher fans is the original Scream. It remains a shame that certain fans have yet to embrace it and that it wasn't more welcomed by hardcores in the first place. Using genre stereotype to go beyond genre stereotype, Kevin Williamson's script is one of the best in horror history, luring audiences into the characters, humor and murders from the first ring of a telephone. With the character of Randy, Williamson inserts all of the fans (himself inclusive) into the movie and dishes up the some of the most harrowing and suspense driven scenarios ever captured on film. To all its detractors, just ask yourself this question: were Hellraiser, Prom Night , Terror Train and The Evil Dead references for the teeny boppers of the nineties? Of course not. Signed in blood from a fan to all fans, Scream's legacy is immortal.